Peeking anxiously through the oven door I was thrilled to see rows of smooth round tops with signature ruffly edges underneath. “Feet eeeeek! They have feet!! !” I gushed. Jumping, clapping and happy dancing ensued. Macarons have been my baking nemesis for some time now. I’ve attempted them many times without much success. They’ve been too flat, too hard, too soft, hollow, and missing their feet. Each time they flopped was a mini tragedy. They almost scared me off for good. It’s been over a year since my last macaron attempt. This time I decided to try a different method. Instead of macarons with a french meringue base, I went with an italian meringue which I’ve read is more stable and creates a less temperamental macaron. It worked superbly! No plastic bowls, I used a glass mixing bowl for the egg whites. Plastic absorbs oils. Meringue and oil are not good friends. Dry out the ground almonds beforehand. Spread the ground almonds on a baking tray and give it 10 minutes on a low heat to get rid of any excess moisture. Weigh every ingredient. I finally have kitchen scales to measure precisely with. In the past I tried to convert from grams to cups which obviously didn’t work out well. Don’t be lazy, weigh it out and check it twice. Sift the almonds and icing sugar together. Sometimes in a recipe the sifting is expendable, this is not one of those times. Stir the meringue into the almond and icing sugar mixture just the right amount. Not too much mixing, not too little. The batter should coat the spatula heavily and drip off in a thick ribbon. 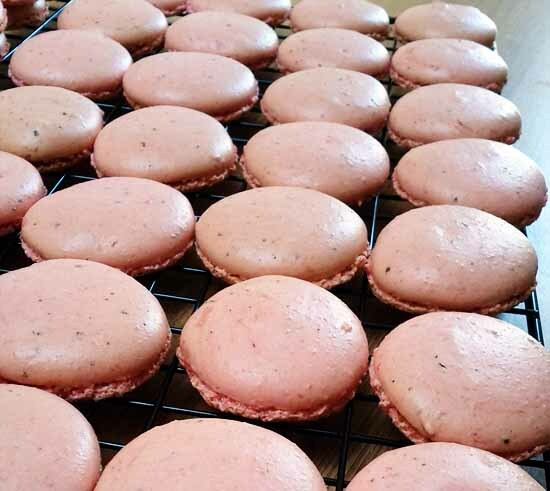 Leave the piped macarons to rest on the baking trays for at least 15 minutes before putting them in the oven. This allows the outside to harden slightly so they’ll bake smooth on top with nice ruffly feet. Tap the baking trays lightly on the bottom after piping the macarons so they settle flat with no air pockets. Cool the cooked macarons on the baking paper for at least 30 minutes before attempting to peel them off. For a full tutorial on how to make macarons with italian meringue, I suggest you study up here or here. 150g dark chocolate, broken into small pieces. Heat 1/2 cup cream until nearly boiling. Remove from heat and add chocolate pieces. Leave to sit for 5 minutes and stir until the chocolate is fully melted, mixed in and glossy. Set aside to cool. Line 3 baking trays with parchment paper. Prepare a large piping bag with a medium/large sized tip. Pre-heat the oven to 150-160c. Sift together the icing sugar, raspberry tea and ground almonds and set aside. Set aside 60g egg whites in a small bowl. Put the remaining 60g egg whites in a large glass or metal mixing bowl. In a small saucepan, heat 150g granulated sugar and 50ml water over a medium heat. Do not stir. You can swish the pan around once or twice to combine the water and sugar and use a wet pastry brush to push down any sugar grains that stick to the sides of the pan. When the syrup starts to bubble, start beating the egg whites in the large bowl on medium low speed until foamy. Slowly add the 35g of sugar and beat to soft peaks. Keep an eye on your sugar syrup. You want to remove it from heat when it reaches the soft ball stage (110c). Slowly pour the syrup into the beaten egg whites and mix on high speed until the meringue forms stiff peaks. Set aside to finish cooling. Stir the remaining 60g of egg whites into the sugar/almond mixture and mix well. Add your food coloring now. You’ll need to use a heavy hand with the colouring as it lightens when the meringue is added and again when baked. Add the meringue to the almond/sugar mixture and quickly fold it together. Use as few strokes as possible. The mixture should be uniformly coloured and without lumps but it’s crucial not to over-mix. Your batter should run slowly off the spatula in a thick ribbon. 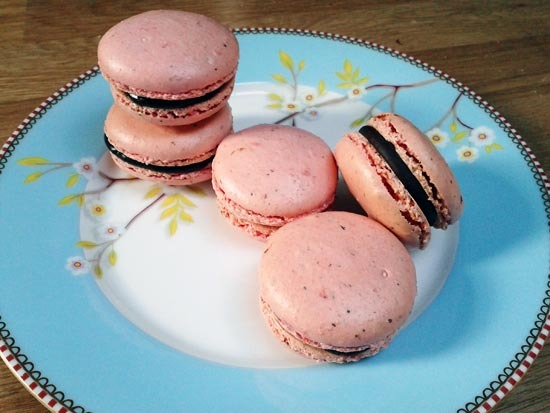 Fill the piping bag and pipe 3cm macarons onto your baking sheets, spacing them a few centimeters apart. Tap the completed tray of macarons gently on the counter and then allow the macarons to rest for at least 15 minutes. Bake at 320-325°F for 14 minutes. Once done, allow to cool completely before attempting to remove them from the baking paper. Match the macaron shells into similarly sized pairs. Spoon the chocolate ganache into a piping bag. 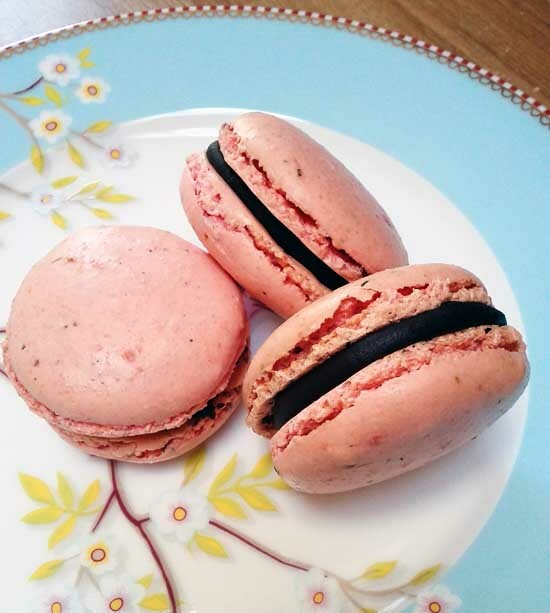 Pipe ganache and sandwich each pair of macarons together gently. Store in an airtight container in the fridge.